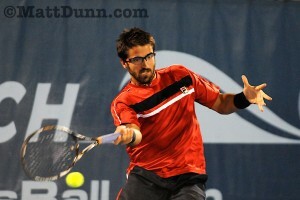 Six-seeded Janko Tipsarevic advanced to the third round of the Delray Beach Tennis International Championships Wednesday night with a 6-2, 6-7, 6-3 win over Blaz Kavcic. In the first night session match, Kei Nishikori eliminated wild card James Blake 6-3, 6-4. The second round encounter was a rematch of the 2008 final whereby Nishikori was also victorious. In the afternoon session third-seeded Sam Querrey went down in straight sets to qualifier Ryan Sweeting, while Ivan Dodig advanced over Dudi Sela 2-6, 6-3, 6-2. 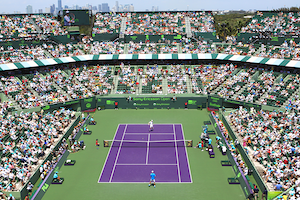 In another second round match Adrian Mannarino rallied from a set down to advance over Leonardo Mayer 1-6, 7-6, 6-4. Thursday afternoon, 2009 ITC champion Mardy Fish will take on the 2004 ITC champion Ricardo Mello. The night session is highlighted by 2009 US Open champion Juan Martin Del Potro who takes on Teymuraz Gabashvili. Gabashvili eliminated John Isner in the first round.